BlackBerry Messenger or BBM enables Blackberry users to experience instant messaging or IM from chatting with your friends on BlackBerry, creating BBM groups among friends, family, schoolmates or officemates, expressing yourself by sharing pictures, videos and even files, or personalizing your BBM profile by displaying your photo, status message, location, and even your favorite music. Now what is Globe BlackBerry Chat? Globe BlackBerry Chat is Globe's newest data plan that gives Globe Postpaid subscribers Unlimited access to BBM plus 200 free text messages to Globe/TM for only P99 a month and Globe Prepaid subscribers unlimited access to BBM plus 100 free text messages to Globe/TM for P15 a day. To Register for to Globe BlackBerry Chat, text BB CHAT ON for postpaid subscribers or BBCHAT15 to 8888 for prepaid users. 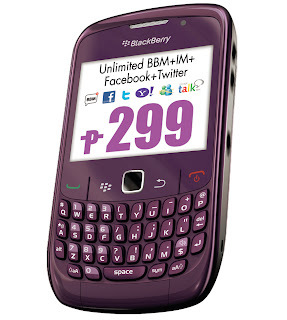 Globe BlackBerry Chat is one of Globe's Globe BlackBerry plans like BlackBerry MAX for unlimited Surfing, Social Networking, Email, BBM, IM and Streaming and Globe BlackBerry Social for unlimited Facebook, Twitter, BBM and IM. BB Messaging for unlimited Email, BBM and IM. For more info, text BB INFO to 8888. 0 comments: on "Globe BlackBerry Chat data plan 99 only for Unlimited access to BBM"